Good sized, very soft, love the pattern. 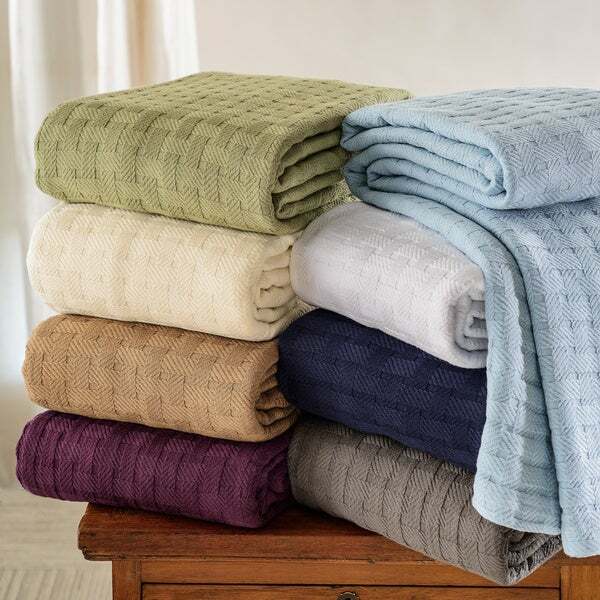 Cozy and casual, this Superior All-Season blanket will add welcoming warmth and luxury to your room. The blanket is crafted from ultra soft, 100-percent cotton fabric with an attractive basket weave and a cross-hatch jacquard pattern. Perfect for all seasons, this machine washable blanket is available in a variety of trendy colors to coordinate beautifully with your decor. Dimensions 14 in x 11 in. x 4 in. Purchase of this particular 100 percent cotton blanket has proven to be my best choice out of the many styles and sizes I have ordered. The reason I say this is, because shrinkage is not a problem at all, and the great news is this particular blanket keeps it shape wash after wash. I do so dislike an unevenly formed blanket with a corner or two sticking out when you fold it. This will not happen if you purchase the Sup0erior All-Season Luxurious 100-percent Cotton Basket Weave Blanket. Do it!! You will see just what I mean. This cotton blanket is outstanding! Unlike other cotton (summer) blankets that I've owned, this one is woven substantially (and beautifully as a basket weave) so that it doesn't stretch with manipulation. It is also sized generously for our king-sized bed. It adds sophistication to the bed and I'm sure will hold up well when properly washed. I'm so glad I decided to buy one for my sister and another for me and my husband. Very pleased overall with this purchase. I haven't decided yet if I want to mess with returning this blanket or not. I ordered it as a lightweight option for my son for college to start the year out in August as he will be in upstate NY in a dorm without A/C. What I GOT was a completely different brand in a different pattern (and I can't even find this brand on the Overstock website to read any reviews on it). I ordered this particular blanket based on the reviews and the tightly woven look on the pattern to try to avoid lots of picks & pulls. We received a chevron pattern and my son says it will be fine, he doesn't care about the pattern - BUT I am wondering about the quality of the product since the brand is different. I just don't like that I was given a substitute item that I don't know anything about and it will be a few weeks yet before it's put to real use…. Online buyers beware I guess…. This blanket washes great and goes over the side of my king bed about 6 inches . I am so happy with my Superior All Season Luxurious Basket Weave Blanket. I washed this blanket today before using and putting on my bed and it washed so great, this blanket is so well made and very very soft and warm. It looks beautiful with my white down comforter and my soft grey throw. I highly recommend purchasing this blanket. I've seen this blanket on different sites, as well as Overstock. I also got a 10% discount and better shipping cost than that " other " site, especially since I"m not a " Prime " person. This was the best deal online. I had a similar blanket in a size Queen. Same folks, Impressions, who made both blankets. My Queen size has a chevron pattern. That blanket seems a bit thicker, but not as soft as this blanket. I really like the basket weave pattern more. I needed to get a King size because my new sheets has an oversized top sheet. It shrank perfectly and fits my thick queen mattress great. Yes, this blanket will shrink due to being 100% cotton. It also washes nicely and needs to be washed and dried for the pattern to look like it does in the picture. The cotton is kinda compressed down when you take it out of the packaging. But again, once it's washed and dried it looks very nice. There are a few imperfections, but not worth nit picking too much. It's a tight weave and hopefully will last a long time. My Queen sized blanket still looks nice after about a year. Basically, for about forty bucks for a King sized blanket, it's a very nice value. I would not hesitate to get it. I'm very pleased overall. I like that it's not really heavy, but does insulate well when it's cool and breathes when it's warm. I live in California and the temp never really gets super cold. I have an extra blanket for those few extra chilly nights. Thanks Overstock, glad you had this. Good quality, substantial weight, and very attractive, but short on the sides- doesn't cover the sides of the mattress. It BARELY was wide enough before washing, then shrunk significantly after the first two washings. I bought the queen size navy color and it didn't fade at all, ( 2 years old now and many washings later) but its so short that it only goes about 2 to 3 inches over the side of the mattress, and has just barely enough to tuck in the bottom. Our mattress is only 9 inches thick- not considered high profile. If I had to buy again, I would size up. I debated whether or not to purchase this under $50 blanket because I thought it would be like one of those under $50 cheap, poorly made blankets at department stores. Boy was I wrong!!! We have a queen sized bed so I ordered a king sized blanket in purple (we like our blanket to overhang the sides of our bed by 8 inches or more). The color is BEAUTIFUL, very vibrant and the blanket is perfect for hot summer nights. It has not 'lost its shape' or color in the washer/dryer. If you're hesitating, don't - you won't regret it!! I bought two of these blankets in the navy color (one Queen and one King) just over three years ago. They are EXCELLENT blankets! These blankets wash very well, and the navy color ( a true navy blue, btw) has not faded a bit through many washings over three years. They are a nice weight, and THEY DO NOT SNAG. And they're the quality of material that gets softer with each washing. Totally worth spending the extra $ for these high quality blankets. Even then, very affordable here on Overstock, and they will last much longer than cheaper blankets. We have a big family of 9, and it's time to replace some older cotton blankets. These are my go-to blankets from now on - I just ordered 2 Queen and 4 Twin XL in ivory and am confident they won't need replacing for many years! Highly recommended! The quality is wonderful--soft, tight weave, nice looking, and it is mega-big! I can tuck the bottom in with ease and and the blanket hangs down on the sides giving great coverage when we go to bed at night. Highly recommend this product. Also bought towels and bath mats made by the same company and was beyond pleased. I purchased white. Wonderful blanket! Very strong yet so very soft. Just be sure to follow the washing directions. I replaced a blanket on our bed that had holes in it and was very thin. This blanket that I purchased is just perfect for our very warm nights in South Carolina. I will buy again when I need another. This blanket is great we use it all the time. It's soft and warm. This blanket is the perfect weight for year round. I tend to sleep hot and I absolutely love it! The plum color is beautiful, the weave is nice and tight, and the blanket is light weight and generous in size. Very happy with this blanket and will probably buy more. Love the quality and color of this blanket.Great for warm or chilly weather.Washed up great ! This is a great king blanket! It's very generous size hangs so nicely over our 12" mattress and box spring. No more fighting for covers. The green is a mid-light tone olive so it's not "washed out" but not too bold either - just a nice soothing color. The blanket was "stinky" when opened but I aired it outside for several hours and then used febreeze. PERFECT! I like the most it is very warm. most definitely recommend. Awesome blanket! I used it for my bed and my boyfriend didn’t like how heavy it was but now I use it for camping instead of a sleeping bag! Very warm and nice! I’ve had for a few years and it’s still beautiful! "Actual size of queens & kings & how much do they shrink. Having problems tucking queens in after they shrink." I bought the King size and washed it and threw it in the dryer on low. It fits fine over my king size bed still. Hope this helps. "How much does it weigh? Have had cotton blankets that are too hot for so cal." "In the picture with all the blankets the purple one looks nice and dark purple but when you click on the color it says plum. Is it a nice deep purple like in the 1st picture or is it plum?" The one we received is dark purple like the picture. We like it and it is soft and comfortable. Trust yours will be also if you choose to order it! I did not buy the purple, so cannot specifically answer your question, but the light blue and ivory I bought was true to the picture as shown. Nice blanket! "Is the "charcoal" a dark grey? It looks like a grey-brown online." I ordered Taupe, and it was brown, so I cannot answer for grey. Their lighting for the picture was way too bright, for sure. "This would be a gift for a picky, special someone. 1)Breathable? 2)Cool enough for summer? 3)Light or heavy? 4)thick or thin? 5)I know this is an odd question, but does the material snag on rough feet or toenails?" It didn't snag on my extremely rough feet. I think this blanket is a perfect summer weight blanket. Perfect for southern California, whether for something to wrap around you under air conditioning, or you just need a llittle something at night without overheating. Very thin, light and breathable. This is not a summer blanket. The blanket weighs between 3-5 pounds depending on the size. I believe it will snag on rough surfaces. "Is the navy blue a true dark blue or is it lighter in real life?" This item is a true Navy color. I just bought one - it is a true navy and absolutely beautiful. Washes and dries just as easy as can be. Great buy! I bought "blue" and the picture is a true color of the beautiful blanket I received. I keep checking back as i' d love to have a seafoam mint or celadon -- colors in the "pastel green" family, which are very versatile to coordinate with other color schemes. This blanket truly is altogether lovely. blessings.